Today will never go down in history as a great day. No television specials, school closures, local festivals, greeting cards, or furniture sales will likely ever honor it. But today I had my own small brush with victory. For the first time in innumerable tries, I won one of those hidden picture computer games. Its name was Magic Academy, and the storyline - such as it was, storylines being mere excuses to move you through levels in these things - follows the player as an orphan girl at a magic academy where her eldest sister disappeared during her studies (and never reappeared. )Weaving ones way through numerous professors and screens loaded with improbably hidden objects, plus the occasional scrambled picture and memory tile game to keep things fresh, "Annie" figures out what her sister was up to and how to get her back. And, yes, there is more than a little resemblance to the grounds and populace of a certain fictional British wizardly institution of youthful instruction, which I'm sure is simply a coincidence. So, nothing earth-shattering in the way of a plot, but you don't play a game like this for the plot depth. But I played it, and I played it pretty darned well, and I won. Now, I did not purchase this game. At least, not directly. It, and numerous other little timekillers, came with the Critter, the laptop I purchased earlier this month as a free trial. Unlike the download version, I was able to play the full version of the game, unrestricted, except I only got to do so for about two boot-ups of a given game. Most of the freebies weren't my cup of cocoa - racing games, mini golf, sports junk - but this one looked somewhat intriguing, so in the interest of familiarizing myself with the Critter's touchpad controls I booted it up last night. I didn't expect to even like it particularly, as I've never had much luck with those hidden picture games. I just wanted to get better at using the thing, and it looked less tedious than Grand Nitro Racing. So I fired it up... and promptly lost the rest of the night as I blazed my way up the levels, quite unintentionally beating the clock. I don't know what the difference was. Maybe it was playing on full screen instead of the cruddy little window you get stuck with playing free games online. Maybe it was the Critter's crisp flatscreen resolution. Maybe, as puzzle matching games go, it just happened to be an easier one. Maybe it was the incentive of actually knowing that, if I kept at it, I could win the game and not run into the Free Trial Version wall of frustration at the end. Or maybe it was sheer luck. Whatever it was, I haven't felt quite this involved in a game for quite some time, especially not a puzzle game and certainly never a hidden picture one. I barely paused for breaks. I switched off to my left hand every so often because my right wrist got tired of the level I had the keyboard set at. I even waited until I had the extra hours to spare to fire up the Critter again today and finish it off on the last bit of my free run. (Was it wrong of me to cook pot roast for dinner on the hottest day of summer thus far just so I'd have the extra free time to play while it roasted?) And I actually did it. I haven't read many books lately. I haven't finished any drums since the White Buffalo Incident. (I've painted up more black rounds for black drums, but no finished ones yet.) I haven't sold anything, or written much of anything, or drawn anything. I haven't taught myself HTML or revamped my websites or mastered 3D computer art. In short, I'm still the same loser I was at the start of the month, the same one I've been for over three decades. But, as I look back on the tail end of June 2008, I'll know that I finally won myself a hidden picture puzzle game. Sometimes, it's the little victories in life that keep it sweet. This morning, I drove out to Best Buy, computer printouts in hand. This afternoon, I came home with a new laptop. This little guy, which was the best system I could find that stayed under the initial 700 buck limit I put on myself. (I received unexpected refunds from the IRS, both the economic stimulus check and another adjustment on my original refund that I hadn't thought I qualified for, which totalled about 700 bucks, and it amused me to think that the government would buy me a new laptop.) Though I went a bit over budget when I paid the extra 30 bucks for a pre-checked and -cleaned version from the Geek Squad. And I bought myself a new game, Fate, because it looked fun and, dang it, I wanna play once in a while. It was also 20 bucks, and I still have my best lucks with games that cost around 20 bucks. Once they added tax... well, I still think I got a decent deal. And I actually did it, instead of talking about doing it. I've already booted it up, wiped the trial version of Office 2007, and put on Word 2003 (though I need to hook it up to the internet long enough to validate its codes and such), and I played a round of Spider Solitaire to help familiarize myself with the touchpad controls (which seem a tad touchy, no pun intended, but no moreso than other laptops I've poked at.) I had a brief moment of panic when I couldn't find the Geek Squad folder they handed me when I bought it, but I called and it turns out, no, they don't give you system OS or other vital disks, at least not when you buy laptops. So that's good. I also got the Vista For Dummies book at Barnes & Noble, which, after coupons and in-store discounts and membership discounts, came out to roughly half price. It'll take some doing, but I'm already growing fond of the little bugger. Yes, I know I still have to clean up and finish the Camp Coyote logo. And I know I have to get cracking on drums and shields and anything else I can throw together to sell to help make up the cost of it. But today none of that is likely to happen. I've earned me some fun time. So, if you'll excuse me, I'm off see about installing my new game. Well, it's been a month and a bit since I last posted. Since then, I've mostly been working my tail off getting in as much overtime as I can at work before the Big Bosses crack down on me. There's currently a 69-hour-a-month limit on what we library pages can work, and I blew past that in May. (I say currently because we may be going union - apparently, even though I've been rather happy with my position out in the shipping center, the majority of pages, who work in the libraries proper, are being treated like dirt and are sick of it - and the hour limit may or may not be changing if that happens.) Once the Big Bosses figure that out, I'll get the obligatory "Don't do that again!" letter that restricts me from overtime for a given stretch of time. So long as they pay me for the hours I did work, I don't much care. You may ask why I've been working so much more. The answer is, I've decided it's time for me to buy a laptop. It's becoming downright impossible to do much on this computer when the cats get in a demanding mood, and as their numbers dwindle they seem to grow more and more demanding. The freedom sounds intriguing, too - no longer would I have to be chained to my desktop tower when I felt like writing. So, even though I'll be stuck getting Vista Home Premium on the thing (shudder), I've started tracking down laptop ads and making my little list of demands. So far, I won't be happy without a dedicated graphics card, at least 2 (preferrably 3) gigs of RAM, and at least 14" of screen space. Ideally, it would be loaded with some sort of word processor which would be compatible with Word 2003, as I hope to use the laptop for writing in cat-free environments and would like to be able to transfer documents back and forth with as little difficulty as possible. It would be nice if it could run simple timekiller-type games, too. I'm leaning toward an HP Pavilion or Compaq, because I don't want to deal deal with Dell or Gateway and I keep seeing disturbing references to a "black screen of death" flaw associated with Toshibas, a problem wherein some of their laptops inexplicably yet with increasing persistence cut out with a black screen and eat whatever was being worked on, requiring a hard reboot. I'm also leaning towards a new machine, because there's not a substantial price difference in refurbished laptops and their specs seem to date fast, like most computers. If I had a clue what I was doing, I'd probably have a lot more I'd want, but right now concepts like battery life and chipsets and WiFi are mere abstractions. Considering the fact that there always seems to be some sort of laptop sale either going on or coming up within a week, and considering that I'm not looking for an ultra-gaming desktop replacement, it looks like I can get something I'd be happy with for under 700 bucks. If any laptop users out there know of anything else I oughtta know about laptops, I'd appreciate some feedback. It hasn't all been laptop hunting and tomato plant planting. 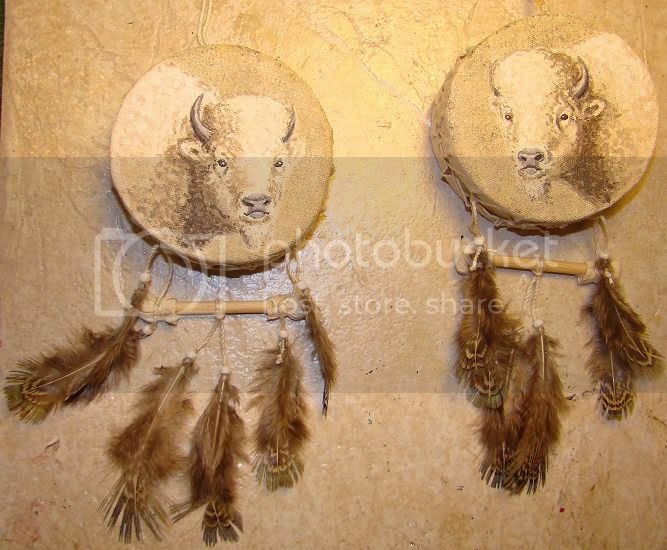 Though various projects have kept me from doing much work at my workbench, I got a commission order for two white buffalo drum ornaments. Sounds simple, right? Well, I'll summarize the experience by saying I was never overly fond of bison before I started this project, and right now if I ever decide to paint another one I should be sent off for psychological evaluation. How bad was it? Well, let's just say I haven't had to cut off the canvas and start over since one of my Xmas ornaments fought me at the tail end of 2007, but I had to this time, only now I didn't have the option of switching subject matter entirely. From ref pic hunting to final gluing, these little white bison have done nothing but fight me. I can't say I'm especially pleased with the results, but there comes a time in some projects where you have to choose between calling it good and walking away and nitpicking on it until Doomsday without significantly improving things. (I say that because stomping it flat, wadding it into a ball, backing over it with the car, and lighting it on fire before chucking it into a ravine while laughing hysterically isn't usually an option.) But I finished them, just about an hour ago, and they get picked up on Monday, hopefully never to darken my doorstep again. I just hope the lady likes them; she asked for a head-on view, but this is as close as I could manage given lousy refs and stubborn buffalo. Front and Back shots. And yes, I know the hooves are mismatched. 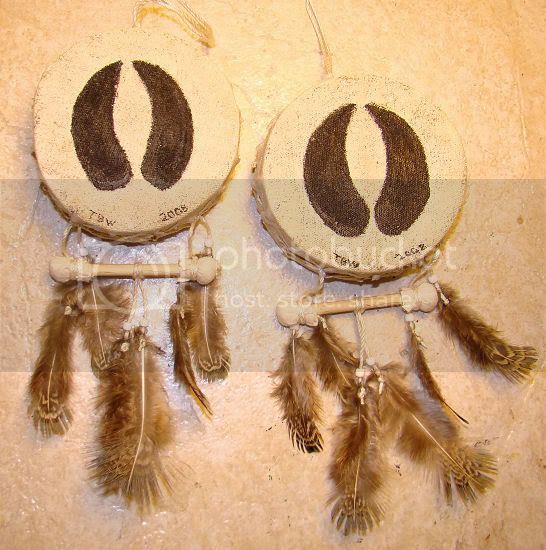 They also came out a bit crooked, despite having carefully squared them up before painting, requiring some creative use of feathers and hanger adjustmets to help hide it. I've never had images "walk" like that before, and I won't be surprise if I don't have them do it since. During the Great Buffalo Fight of 2008, I ended up working on spur projects once in a while to keep me from doing irrevocable damage to the things. One of these resulted in a black drum ornament blank. Basically, I painted two canvas rounds black and strung them up with slightly darker crochet thread, without a clue what I was going to do with it. It's hard to describe, but some things, once started, gnaw at your mind until you can complete them. Something about this black drum ornament blank has been doing that. The moment I tied it off, I started looking at it and wondering. What would look good on this? What could I do with this? Images of phoenix feathers glowing against the darkness, dragons against the night, unicorns under moonlight started popping into my brain. I still don't know how I'm going to finish it, but it gave me something to look forward to while I wrestled with stubborn bison. I even painted up more black rounds, and I just got a bottle of black gesso to use on more test rounds (to see if it doesn't make the canvas as stiff as the acrylic paint.) So, between those and the ongoing debate about what I'm going to do with my spirit shields to make them more than just a glorified drum ornament, I figure I ought to be set for a while at the ol' workbench. Assuming I don't lose too much time to the new laptop, that is. Or replanting tomato plants.